Most visitors to San Antonio have seen the downtown section of the Riverwalk with all the restaurants and bars. While that's a beautiful and fun spot, my favorite for walking is the Museum Reach to the north. Also called the Urban Section, it was designed by local firm Ford, Powell & Carson. Landscaping and public art were considered from the beginning of the planning process. The result is an urban walking trail that integrates beautifully with its surroundings. Opened in 2009, it's a great place to enjoy the river in a less crowded, more natural setting. An important plus is that you can begin your walk at the beautiful Pearl Brewery complex where parking is plentiful and free. I previously posted about The Pearl when I attended The Herb Market in October. I recently stopped in to enjoy a walk and see how the drought had affected the plantings. It's raining today! A rare rainy day here, but I knew that might happen and took these photos yesterday evening. We have had great weather here so I had no problem finding blooms for my first Garden Blogger's Bloom Day post. Join Carol at May Dreams Gardens and other garden bloggers as we post what's blooming today in our gardens. Lots of single blooms because it was a tough summer and we've had a couple of chilly nights. How often does a nursery let you run with scissors in their demonstration garden? Take cuttings from any plant you like and they will help you root them. Not too often, that's why the propagation class at Hill Country Gardens in New Braunfels is so popular. A deal too good to pass up, yesterday I had the opportunity to attend one of the classes. The presentation table is ready for the class. Great setup and refreshments added to the fun on a pretty day. The table base is a greenhouse truss and the beautifully curved top is pecan, cedar, oak, pine, and cypress woods. It's covered with plastic today for the presentation, I'll get a better photo next time. Andrea, the owner, started things off with a demonstration on propagation methods and how to take cuttings. Soft, green tip cuttings work best. You can also root woody stems from plants like Rosemary and Lavender by removing the needles along the stem to expose the cuticle. Then we were given a small bucket of water and invited to roam the gardens for cuttings to fill the 72 cells in our trays. You can read about the gardens in my previous post. I also brought cuttings from home. Hill Country Gardens provided the trays, soil mix, rooting hormone, tags, snips and, the most important element, their greenhouse with misting system. After collecting our cuttings, we poked holes in the trays with skewers, dipped cuttings in the rooting hormone provided, and set them in. No problem filling these trays with cuttings from the well established garden of Texas natives and adapted plants. After we filled our trays, we took them into the greenhouse where they will be misted every ten minutes. This class will be given again on Saturday the 12th and Sunday the 13th at 1:00 pm each day, this table will be really full by Sunday afternoon. There are also seminars from local gardening experts scheduled each day. Around mid February we will get an email letting us know our cuttings are ready to pick up. It's going to be so much fun to see how my cuttings turned out. A greenhouse clearance sale was in progress and I picked plants on my list as well. Another fun day and great special event at Hill Country Gardens. This year the Russian sage (Perovskia atriplicifolia) seems more intensely blue than previous years. Could it be the weather we've had brought out the color more? Or perhaps so many other things didn't bloom their best this year and that just makes it seem so much prettier right now. Russian sage is a great garden plant for many climates. I've seen it blooming in Colorado even after the first snow of the season. It's common in Provence to supplement lavender's earlier bloom time. It does look similar to lavender doesn't it? Russian sage is less picky than lavender, these plants replaced lavender that didn't do well here. It works great in this hot island between the sidewalk and the circle drive. Russian sage loves our full Texas sun. When planted in morning shade it will flop over and reach for more sun. It's such a beautiful plant I plan to add as many as I can fit in. The issue on my mind today is planting diversity vs single variety plantings. This post showing changes we have been making to the front yard beds is prompted by inputs from David at The Desert Edge. Not a bad choice for the local shopping center, but not so good for a color loving gardener like me. One of my favorite things about San Antonio is how colorful everything is and I enjoy bringing that home. Definitely time for some changes. A gardening friend shared a native Velvet pod mimosa (Mimosa dyscarpa) which will eventually grow up about six feet against the stone wall. One of the large red yuccas has been transplanted to the back yard and the others will be divided and planted along side the driveway in the near future. 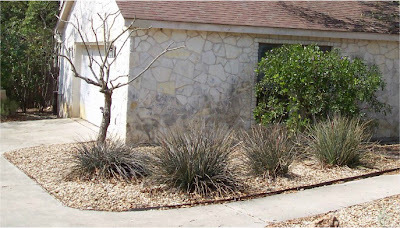 The early plan was to replace them all until David featured hesperaloe in some of his posts and, combined with the really hot, dry summer of 2011, I began to rethink the plan. Instead of removing the rest of them this fall, we have divided and relocated them around the bed to fill in the space. Three of the larger original ones remain in place. The tree form vitex remains and the Texas Mountain Laurel is kept full and shrub-like in front of the garage window. As always around here there's more work to do. Two more gold lantanas will be added in front of the agave. The old landscaper's border will be pulled out. The red yucca should bloom again next spring and the agave is growing well and looks good all year while adding interest that was lacking before. The Mexican Bird of Paradise should take off next year and really bloom. A more disciplined gardener might have left all the red yucca, but I enjoy seeing the new mix with the agave there whenever I pull into the driveway....and isn't that the purpose of a garden? The Japanese Tea Garden in San Antonio's Brackenridge Park completed another phase of its restoration on October 15 with the reopening of the historic Jingu House as a restaurant. Originally begun as a lily pond in an old stone quarry, the gardens were completed in 1918 by prison labor. The Jingu family lived in the house, also running a tea house there from 1926 until they were evicted during WWII. The gardens were also renamed the Chinese Tea Gardens at that time, and only changed back to its original name in 1984. Over time the gardens fell into disrepair and were renovated in 2008 with funds from the city and private donors. The reopening of the original house as a restaurant marks the completion of the second phase of renovation and provides yet another reason to visit the gardens. From the the rock pagoda to the bridge in the garden, Japanese style has been reinterpreted with local materials and building techniques to create a unique and beautiful place. Breathtaking in beauty and scale it's a must-see for those who enjoy gardens, ponds, waterlilies, fish, birds, stonework, bridges, old stone buildings, interesting walks....Did I miss anyone? This trail leads through the stunning rock columns supporting the pagoda. No surprise I took so many pictures that there are enough for at least one more post showing more details of the flowers and foliage in the gardens. Brackenridge Park is close to downtown and the San Antonio Zoo is nearby. No admission fee for the gardens and parking is also free. Accessible entrances are available for both the pagoda and the lily pond gardens.